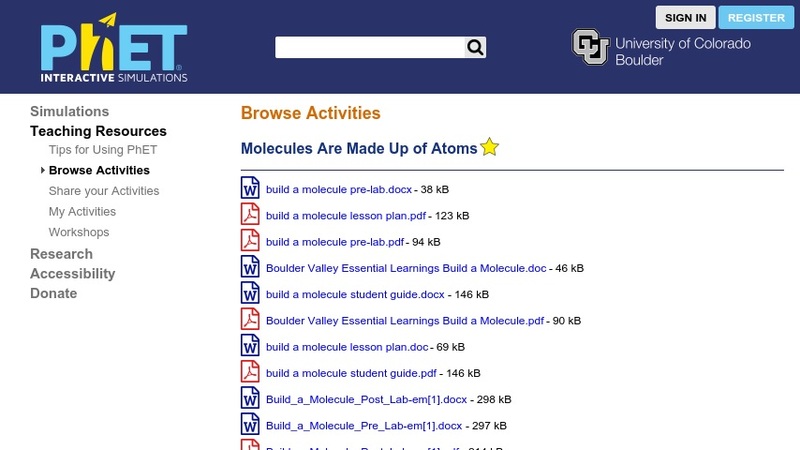 This is a set of packaged lesson materials for middle school, created for use with the PhET simulation Build A Molecule. It gives explicit guidance in using the simulation to construct simple molecular models. It was designed to help students distinguish atoms from molecules and build a fundamental understanding of chemistry nomenclature. Materials include complete lesson plan, warm-up questions, guided student activity sheet, and assessment. The molecule building simulation, which must be open and displayed to complete this activity, is available from PhET at: Build A Molecule. This lesson is part of PhET (Physics Education Technology Project), a large collection of free interactive simulations for science education.